We loved the space & the location. Great place!! The view of the lake is great! The unit was great! Loved the location, access to the water, etc. Very beautiful place, very clean even with the ability to bring pets, hot tub was hot, and pool area clean, had backup supplies to include advil. Both the location & the amenities were great. We were not missing anything we might have needed. What a great place for a get away! We had a little family reunion and Chateau 20 was perfect! Close to many attractions and hiking trails and a great respite to come back to. 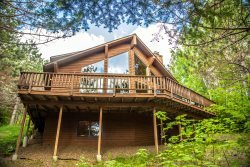 Beautiful view overlooking Superior, lovely lobby area and large main deck with fire pits, and great to have a pool and hot tub for rainy days. The staff on site were incredibly hospitable and welcoming. We would recommend Chateau 20 to others and keep it in mind ourselves for the future. very thorough and great follow up. Great place! Love being right on the water. Great space. This was our 2nd year staying at the Governor's Cabin and we thoroughly enjoyed it. Great location, comfortable beds, and a true "up north at the cabin" feeling without all the issues of owning a cabin. Fantastic cabin! Beautiful, and equipped with every thing you need for a relaxing vacation. Second stay at this property. We really love it. Quiet and great location. This was the perfect place for 3 girlfriends & their two small dogs to have a 4-day stay on Superior. Enjoyed the deck overlooking the lake, kitchen was well supplied, wood burning fireplace for cooler days, beds were good. The walks down to the beach were great, large deck with firepit was enjoyable, indoor pool a big plus. Appreciate them checking in with us to make sure all was ok. Everything worked out fantastic! The location is great - super private and TONS of space! The kitchen was fully stocked, satellite TV was great to have and all the extra movies and games and puzzles were awesome. Highly recommend this house! The house was fine, clean and it looked like new. The location and the view are excellent. Nice condo could use some updating but comfortable and a beautiful view. I did have trouble using the number that was on the contract. It did not go to voice mail. It just said the office was closed. I finally wrote an email which was responded to. On the last day at first no voice mail but then got through. This would have been dicey it a pipe had broken or if something else happened. The house was very nicely appointed and just steps away from the water's edge. The property is beautiful. Great Lake. Very few cabins and very quiet. The cabin has everything you need. Great deck area. Nice kitchen, eating and living areas. Great dock! The bathroom needs work. It smelled bad. The floor needs to be replaced. The shower curtain was filthy. The cushion on the bench was dirty. Having to take the garbage is inconvenient but not a deal breaker. The location is great. Love the north shore! More than we expected. Very quiet and secluded yet close to everything. Very private which was super nice. Huge manicured lawn which was fenced in with a driveway gate that really surprised us. We have a German Shepard mix and he got plenty of exercise. Nice to be able to bring him along on vacation. There were just to two of us but plenty of room for more. Well stocked kitchen and everything worked well and my wife loved the soaking bath tub with jets that soothed away aches and pains. Awesome updated bathrooms and the beds were extremely comfortable. The deck was just awesome. Spent a lot of time on it. We enjoyed the huge overhang from the house which allowed us to sit outside even in the rain. From the deck we saw seagulls, bald eagles, hummingbirds. A virtual paradise. At one point there were 6 bald eagles hovering overhead. Nice to have the telescope to view ships passing by too. We've been coming to the North Shore for years and this is at the top of our list of places to return to. This home suited our needs perfectly. No need to bring any books as there are plenty to choose from. The piano is a very good one and was in tune. The TV is complicated to figure out, but we only used it for playing CD's so it didn't matter. The home is very private and very quiet. It is well-built and well-designed. I highly recommend it to anyone who wants to get away from it all. Everything was perfect! It was such a beautiful cabin. We will definitely be going back! We enjoyed our stay at Chateau LeVeaux and apartment 30. The location on the North Shore ensures easy access to many wonderful sight seeing highlights. The entire place was quiet, there was plenty to do in the game rooms and pool on sight. This apartment allows for pets and we had one. However, the apartment was very clean and well kept up. The host couple were friendly and helpful in every way we had need. Pretty much a painless process. I was kept well informed via email. The house was great. I came up to the Tofte for the Lutsen 99er mountain bike race with a group of guys and we absolutely loved the place. It was in great shape, it is incredibly spacious, extremely comfortable, and has stunning views of Superior. The place had everything 4 guys could possibly want for a short two night stay. The garage was key for our group, it gave us the option to storing our bikes indoor vs. leaving on the car overnight.